This dog carries two copies of E which allows for the production of black pigment. However, this dog's coat color is also dependent on the K, A, and B genes. This dog will pass E on to 100% of its offspring. This dog carries one copy of E and one copy of e which allows for the production of black pigment. However, this dog's coat color is also dependent on the K, A, and B genes. This dog will pass E on to 50% of its offspring and e to 50% of its offspring, which can produce a yellow/red coat (including shades of white, cream, yellow, apricot or red) if inherited with another copy of e.
This dog carries two copies of e which inhibits production of black pigment. The coat color of this dog will be yellow/red (including shades of white, cream, yellow, apricot or red). This dog will pass e on to 100% of its offspring. The two major pigments that impact canine coat color are eumelanin (black pigment) and phaeomelanin (yellow/red pigment). These pigments are produced within specialized cells called melanocytes located in the canine epidermis and hair follicles. Within the melanocyte, the pigments are made in tiny organelles called melanosomes. The melanosomes are continually being transferred from the melanocytes to the surrounding keratinocyte cells that make up the hair and skin, thereby giving the skin and hair specific color based on the type of pigment they contain. The MC1R gene, also known as the extension (E) Locus, controls the production of eumelanin (black pigment) in the melanocytes. The dominant form of the MC1R gene (E) allows for normal production of eumelanin in the melanocytes. However, a DNA variant in the MC1R gene (e) shuts down production of eumelanin (black pigment) in the melanocytes leaving only the production of phaeomelanin (yellow/red pigment) in the melanocytes. Because e is recessive, two copies of this MC1R e variant must be present to express the solid “yellow/red” coat color. A dog that has two copies of E (E/E) will not have a yellow/red coat and will not be capable of passing on a yellow/red coat color Allele to its offspring. A dog that has one copy of E and one copy of e (E/e) will not have a yellow/red coat but will pass on the yellow/red coat color gene e or the black coat color gene E to 50% of its offspring. A dog that has two copies of e (e/e) will have a yellow/red coat and can only pass on the yellow/red coat color gene e to its offspring. Genetic testing of the MC1R gene will determine whether a dog is a genetic Carrier of yellow/red coat color. 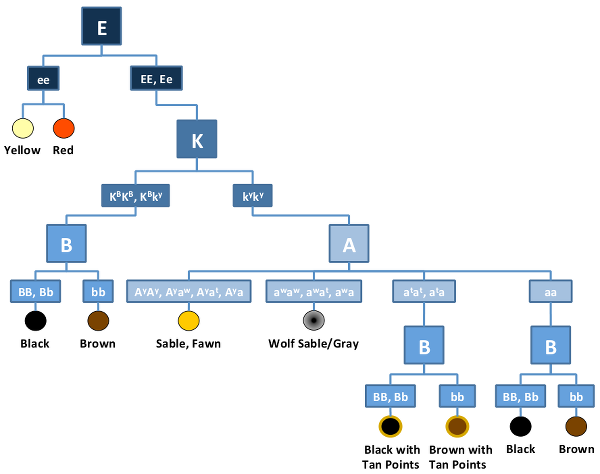 Located at the top of the known canine coat color genetic interaction flowchart, the E Locus is dominant to all other coat color loci. Dogs with an e/e coat color genotype will have some variation of red, apricot, yellow, cream or white coat coloration depending on the breed and other genetic factors but will not be black or brown. Yellow/red coat color is inherited in an Autosomal Recessive manner in dogs meaning that dogs need to inherit two copies of the e Allele to have the characteristic yellow/red coat color. Each pup that is born to a dog with yellow/red coat color has a 100% chance of inheriting one copy of the e variant of the MC1R gene from that parent. To produce only yellow/red pups, both the dam and the sire must be e/e. Dogs with E/E or E/e genotypes will have a black coat color. However, the dog’s coat color is also dependent on the dog’s genotypes at the K, A, and B genes among others. Normal results do not exclude inherited mutations not tested in these or other genes that may also contribute to coat colors and traits in dogs.